I like to share great examples of nonprofits using social media, and I get even more excited when people engage around wildlife. We’ve talked about the benefits of crowdsourcing, but more and more I’m seeing several benefits to asking the community great questions. In case you haven’t read about Quora, this site has recently received some attention and it works similarly to Yahoo Answers or Aardvark. 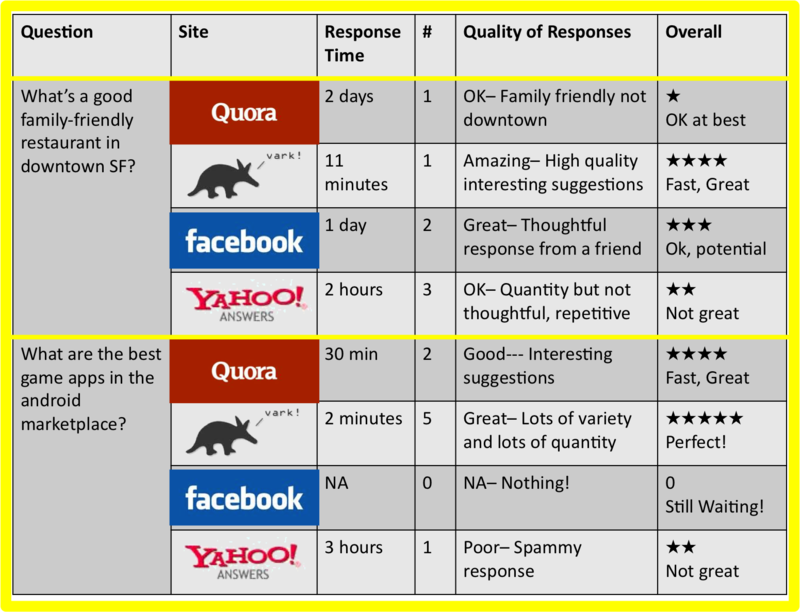 Since I’ve been curious about the growth of sites like these, I found this chart helpful for comparing the strengths and weaknesses of the Q&A networks. Both nonprofits and nature lovers could use it as a chance to answer and ask questions while building relationships. And you know I’m all for that! Who’s testing Quora out now? What do you think? Danielle Brigida I can't get enough of this world and all of its inhabitants. I love learning, and I'm never bored. I'm particularly interested in science, literature, animals and making the most out of every day that I'm on this earth. You might not of heard of iSpot.org.uk in the UK – a fantastic site for crowdsourcing IDs. It has been really cleverly set up and has aggregated lots of top species experts as admins. Worth a look. What an awesome site! I love it. Thanks so much for sharing! It is isn’t it… I love it. Saw that you just tweeted it as well. We use it for our BioBlitzs in Corfe Mullen – posting pics from the day and getting help on IDs. Because it’s got some top naturalists on board (and set up with help from British Natural History Museum) it’s a great facility…. and it’s only a couple of years old.Has the potential to be massive (I think they are already looking at apps). It’s fantastic. We have similar sites (NWF actually help start) enature.com – but I love the collaboration on the site you’ve showed me. enature.com now in my bookmarks. Thanks! I travel to the States quite a bit – mainly Florida Keys (and I’m always baffled by your wildlife – I’m a duck out of water away from the UK and need all the help I can get!). Often use Flickr as a general resource for ID’s as well – some great experts on there who are happy to help. CHECK OUT http://www.facebook.com/indiawildlife this to know more about wildlife.